Ladies should probably leave the Blahniks at home. In traditional Irish-pub fashion, McSorley’s floor has been thoroughly scattered with sawdust to take care of the spills and other messes that often accompany large quantities of cheap beer. 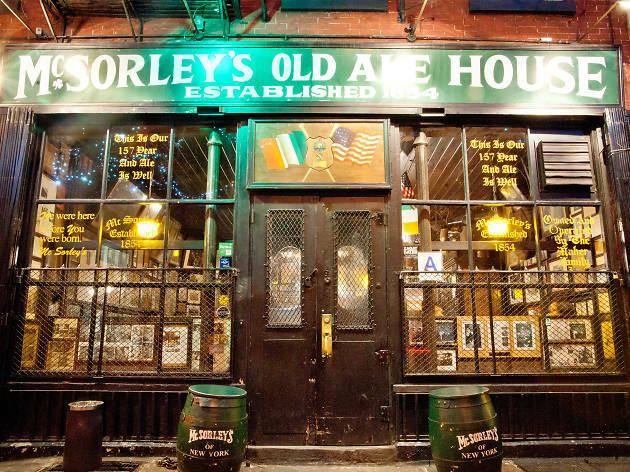 Established in 1854, McSorley’s became an institution by remaining steadfastly authentic and providing only two choices to its customers: McSorley’s Dark Ale and McSorley’s Light Ale. Both beverages have a lot more character than PBR, though at these prices, it won’t be long before you stop noticing. This is the best jumping off spot for a night out in New York. Ancient, bustling, bohemian Irish bar that attracts locals and tourists willing to put up with just two choices of beer. Light or Dark. The beer is OK, but the real flavour is in the atmosphere. We went on a Saturday night at 8pm. It was full to bursting, yet somehow the crush was part of the fun and the bar staff efficiently got beer to all with remarkable dexterity. Reminded me of big nights out in old Dublin bars on Baggot Street. We made new friends , scanned the historic pictures on the walls and headed out with broad smiles. I wish there were more pubs like this around the world. There is no place on this planet I'd rather go as part of a night out. The dark ale, skip the light, is so smooth. The cheese and cracker platter, get the large, is a perfect accompaniment! The place is brimming with the history of New York and the US. Try to just sit back, sip your beer, or chug 2 at a time, whatever floats your boat. Don't dawdle, this is NYC and the waiters are busy. Order quickly or ask the waiter what to have. Great bunch of guys. Sometimes gruff, sometimes not. I've been coming to McSorley's for over 30 years and when I walk in, I get a big bear hug. What's better than that? I just brought my oldest daughter for the first time and when we walked out, she looked at me and said, "I get it!" No place like it. I've lived here for 10 years and I just went here 2 weeks ago. I was immediately in love. I've gotten really into grungy bars and this is no exception. I loved the warm fireplace, the open space, the cheap prices (not so much) the grumpy bartenders but I guess it's all apart of the charm of the place. Definitely bring a large group here, CASH ONLY and don't have an attitude, you'll just end up mad. 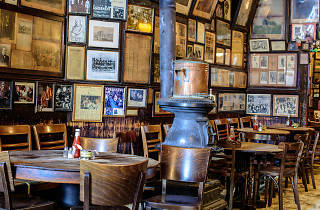 McSorley's is an ale house that everyone in NYC, whether visiting or living here, should experience at least once. You're greeted at the door by an older man, and you're led into a dark and loud pub. When you order, you have two choices to choose from - light beer or dark beer (my college friends and I made fools of ourselves in front of the waiter trying to figure out what we were going to order for 5 minutes before he said "you can get light beer or dark beer"). Though this place can get a little touristy, this is a landmark in NYC, so try to visit it during the evening before people go out for the night. And if this place isn't your jam or it's too crowded, you're right in St. Mark's Place around tons of other bars that you can venture off to. Fun to at least try once because of the history of it. Enjoyed the beer, but for me personally was WAY to crowded, and I went at like 2:00 PM. Can't even imagine what is it like later on in the night. Loved all the history on the walls, but again it was even tough to move around and check out the entire bar because it was so cramped, but so are a lot of places in NYC anyway. Loud and cramped? Double yes. Still somehow maintains a sense of charm as undoubtedly one of the most iconic watering holes in NY? Lots more yes's. 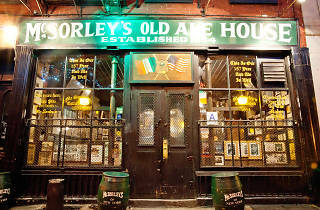 McSorley's is what probably comes up when you type "oldest NYC bar" into Google. (*editors note: checked, and yes it is). And don't think for a second they don't play that up. Assuming you are indeed coming from out of town to drink here, the main thing to know here is that they serve 2 beers and 2 beers only- just order light or dark. In a culture of bars boasting draft selections that read like Hemingway novels (who I can only assume drank here, by the way), McSorley's puts its [fat, hairy, Hobbit-like] foot down and stays true to its simple roots. The waiters are some of the nicest dudes I've come across, even more remarkable considering their loud, rambunctious patrons (who, don't get me wrong, are fun to side beside, just not to serve). Come to McSorley's, sit at a table with people you don't know, and don't you dare order a vodka soda. As a New Yorker, you have to go to McSorley's at least once. It's the oldest bar in Manhattan, after all! This place just could never be anything but a destination bar for me—I could never come here regularly. But it definitely has its quirks. 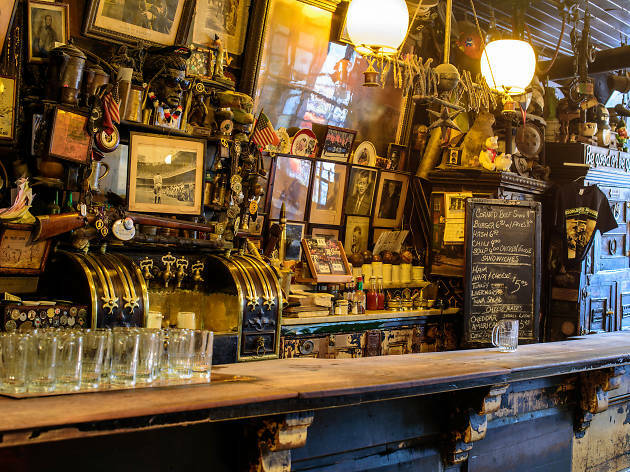 McSorley's sells two beer options—light or dark—and the place is a living piece of history. There's stuff all over the walls, the bartenders are all old men who can carry 10 pints in each hand, and it's really quite dirty and messy. And LOUD. Come here for a small stein of beer, look around, watch the bartenders do their thing, and exit, waving goodbye as you leave to the old Irish bouncer sitting on a stool outside the bar. Classic New York City establishment - choices are made easy here as you have two options, light or dark beer. There's saw dust on the floor, real irish bartenders, and old memorabilia on the wall. Apparently in the 70's this bar was just opening up to women, my mom remembers coming here and the stalls not having doors in the bathroom. Today it's a little more well equipped for us ladies. Light or dark?! 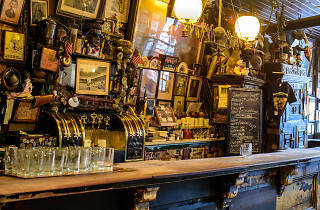 Don't make the mistake of ordering a mixed drink at the NYC's oldest Irish bar, light or dark McSorley's beer is your only option. The surly bartenders are part of the pub's charm, as is the saw dust coated floors and the John F. Kennedy memorabilia all over the bar. It doesn't look like the place has been touched in decades, which is mostly true. The wishbones hanging over the bar were a tradition for World War I soldiers heading out to war and a reminder of those that didn't make it home. It's become somewhat of a touristy stop, but visiting it is a must. A New York institution. Service may be a little gruff but the beer is great, as is the Irish food! Perfect spot for a solo Sunday afternoon pint. Most overrated hellhole in the city. 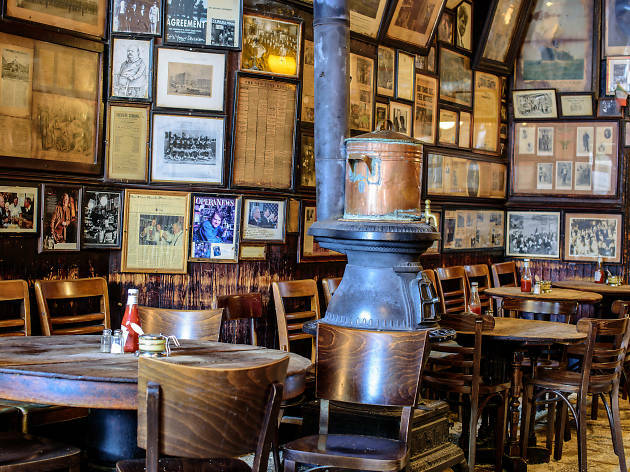 If you specialize in one thing, as McSorley's only serves beer, then you'd better do it right. The bartenders do not know how to pour beer, however, and the servers are the rudest and most unprofessional around. The glasses are slammed down on the table at room temperature, half full of foam. Once the foam settles, before you've taken even one sip, the beverage is only 75% full. If you're going to under-pour me warm, foamy beer, at least do it with a smile. I'm a young woman, and the server yelled at me, loudly and publicly, for reasons I still don't understand. My boyfriend asked him nicely to stop insulting me and please bring our drinks, and the guy said, "Why are you telling me what to do? I'm busy!" As a server, it's your job to take orders, so get used to it. My boyfriend attempted to escalate to a manager and was asked to leave. There were people blackout drunk all around us, running to the bathroom to vomit or being carried outside by their friends. My boyfriend had nothing to drink and was calmly attempting to rectify a service issue, and they tried to bounce us. We left anyway, because who would want to stay there, but a place as old as this one should operate with a better understanding of customer loyalty and appreciation. They seem to justify the gruff service as traditionally Irish, but I've been to Dublin and this behavior would never fly in actual Irish pubs, where everyone is warm, happy and gracious. Old McSorley must be rolling in his grave. Worst night out in months. AVOID. Great place to drink and eat. From out of town and look forward to returning each time. Lots of character and no nonsense flair. I remember the days when women weren't allowed to darken the door of this pub. Strange days indeed. I wonder how many of the new crowd know that.